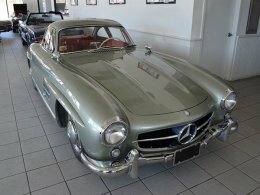 The 1954 300 SL Gullwing served as Mercedes-Benz's ticket into American hearts and garages. Thought to be too safe and boring prior to this model, the Gullwing showed consumers a sporty but still luxurious vehicle. With only 1, 400 units produced that year, this automobile features the trademark upward-opening doors of the time. In addition, the Gullwing was the first gasoline-powered automobile that featured fuel injection located directly in the car's combustion chamber. Often ranked in the top 10 sports cars of all time, the Gullwing is a true Mercedes-Benz icon. 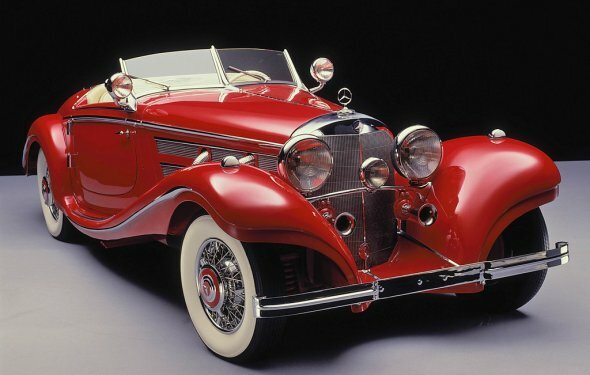 Part of the 1930s heyday of Mercedes-Benz design, the 1936 540 K Special effectively set the benchmark for available horsepower in an automobile. The "K" stands for Kompressor, and this vehicle was able to pack 180 horsepower in its frame, making it one of the fastest and most powerful cars available in a time when most were unable to break 100 horsepower. The enormous engine needed to maintain this level of power meant that the 540 K Special had an exceptionally large and heavy front end that could sometimes become cumbersome through curves. Part of a more experimental line of Mercedes-Benz vehicles, the 1970 C111 tested many technologies all in one model. Outfitted with a diesel and mid-mounted engine, the C111 was also one of the earliest automobiles that featured air conditioning. In addition, the slim, fiberglass body design of this car allowed it to drastically reduce drag and reach driving speeds above 200 miles per hour. Another highly influential sports car, later improvements of the C111 allowed the car to reach speeds in excess of 250 miles per hour. Similar to the 300 SL Gullwing, the 1955 300 SLR Racer is also based largely on the streetcar. However, the tubular aluminum frame of the SLR Racer makes it much lighter and faster than its predecessor. In addition, this vehicle was the first to make use of air brakes. 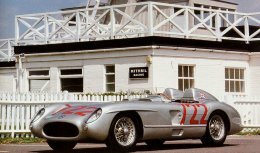 The capabilities of this racecar helped legendary driver Stirling Moss set new records at the 1955 Mille Miglia.